Nagomu Records was a label founded by Uchouten leader and vocalist Kera at the beginning of the 80's. It was just a way for him to release the Uchouten recordings at first but it became one of the most important independant label in Japan by the end of the decade. Uchouten and Kinniku Shojotai went on major record companies and Zin-Say transformed into Denki Groove at the beginning of the 90's. 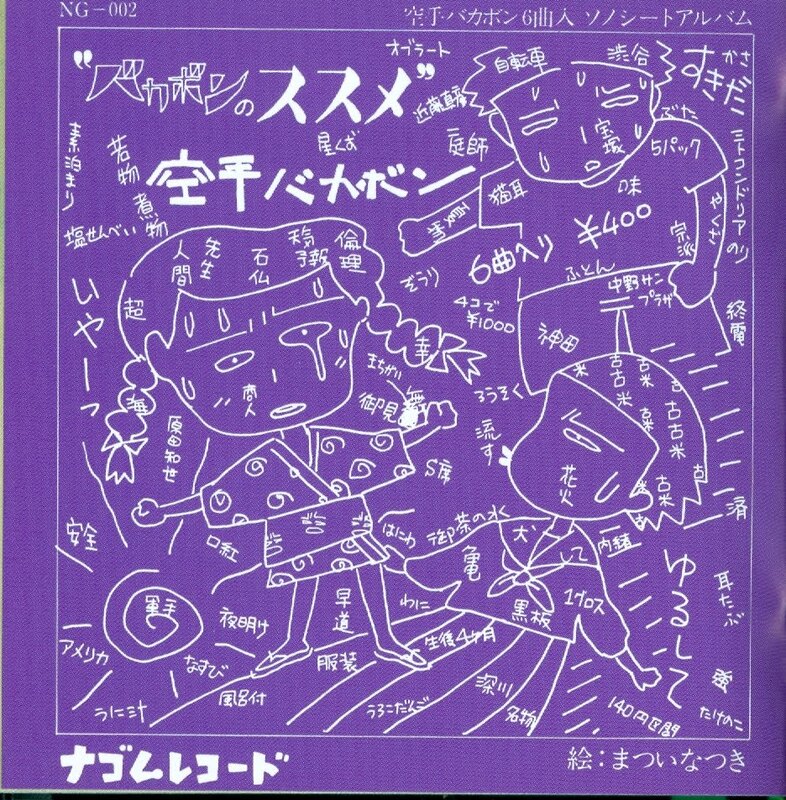 But in 1983, Nagomu has only released the first Uchouten sonosheet and Kera is looking for another band. He went to the same high-school as the Kinniku Shojotai members and became friends with them. But he refuses to release their first record because it was just bad hard-rock at the time. He decides to form a side-project unit with two of their members, Kenji Ôtsuki and Yuichirô Uchida. Just for fun. No one takes the band seriously and most of the songs are composed and recorded at home on the Electone keyboard of Uchida's father. The band is named Karate Bakabon (a mix between 'Karate Baka Ichidai', a manga based on Sonny Chiba's master Masatatsu Ôyama' life, and 'Tensai Bakabon' known in the west as 'The Genius Bakabon'). "Bakabon No Susume" is released in september 1983. It contains 6 tracks of cheap home-made techno-pop (everyone in the band was fan of Yellow Magic Orchestra, Hikashu and the likes) and some spoken interludes about an enigmatic deity named Bakabon and his sect of believers. This record is pure genius for some and just plain garbage for others. Meganekun, i was a teenage Nagomu gal! Love this album. Went to Japan in 1989 and my friend and I listened to it constantly! !